A Whitecoat. This is from an old dilbert cartoon, but i think the flock would find it funny.. Wallpaper and background images in the Maximum Ride club. 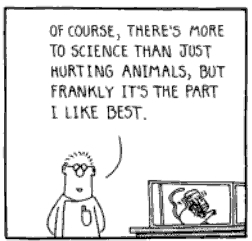 This is from an old dilbert cartoon, but i think the flock would find it funny. This Maximum Ride fan art might contain newspaper, paper, magazine, tabloid, rag, anime, comic book, manga, and cartoon. why do ppl have to hurt animals?? ?